We hear so much about the obesity problem among adults and children in the UK that you would hope food retailers would feel some need to help address the problem. But no such luck! McDonald's have done it again - introduced a super-size version of their Big Mac with 45 per cent more calories! Yes, they have come under fire from the National Obesity Forum for producing a 'Grand Big Mac' which weighs in at 741 calories, 45 per cent more than the 508 calories in a standard Big Mac. It contains 15g of saturated fat, 58 per cent more than the standard Big Mac and three quarters of the recommended maximum for women and children, as well as 58g of carbohydrates, including 12g of sugar (that's three spoonfuls). This whopper went on sale yesterday to celebrate the 50th anniversary of the Big Mac. It makes me think that a more befitting anniversary gesture might have been for McDonald's to have launched a 'Special Mini Mac' at 250 calories, as it comes at a time of growing concern about the impact of weight on health. Representatives of the UK's Obesity Forum are quoted in the UK press as saying that if McDonald's was at all concerned about obesity, it would not so blatantly disregard the accepted limits of fat, sugar and salt. 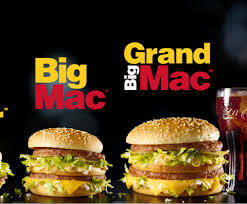 I suppose the only saving grace is that the Grand Big Mac will only be available until 20th March. Thank goodness for that, but DON'T rush down and by one!